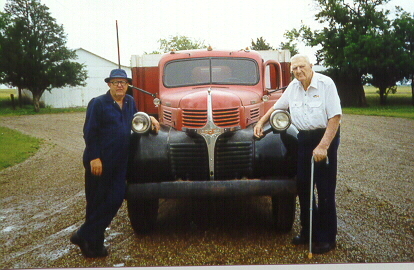 This page is dedicated to all those folks who are interested in the early trucks of the "Job-Rated" era. 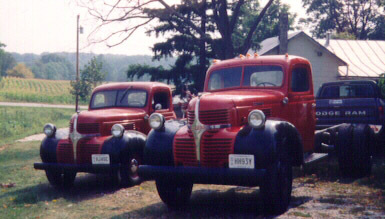 The light trucks built by Dodge, Fargo, Plymouth and Desoto from 1939, on through the War, and postwar until 1947 are included in this special interest truck site. In the near future the site will expand to include resources and lists of trucks and their owners; photos are needed of all the surviving trucks. Send yours in! We have a group forum for discussion of these wonderful trucks. You are encouraged to go to http://groups.yahoo.com/group/39-47Dodge and sign up as a member of this forum. Once you have signed in as a member, you have access to the files, links, photos and all the connections to the resources. We are working together to support the knowledge and the interest in these trucks. The forum is very useful in sharing ideas between all of the registered 39-47 Dodge truck owners. A list of all registered trucks is located in the data base on this forum site. We also are planning on a semi-annual newsletter; the first issue is to be published soon. Well, we thought it was soon. Now its later. A lively discussion of current topics can be seen on the link above. Please check it out. Join Up!! In the mean time, for an excellent background article read Don Bunn's piece on these World War II era trucks. I also recommend the following reference book: Dodge Pickups : History and Restoration Guide, 1918-1971 by Don Bunn and Tom Brownell; I would not attempt to restore a truck without this book and the list if references that it provides. In the meantime, check out this site that provides A Brief History of Dodge Trucks. Its a primer for the background of the first Job Rated trucks.